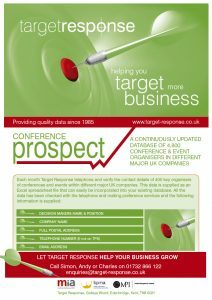 Since 1985, Target Response has supplied databases containing the contact details of marketing organisers, conference and event organisers, PAs and HR decision makers within major UK organisations for your mailing, telemarketing and emailing campaigns. Our Marketing Prospect database provides the contact details of the marketing decision makers within 7,200 major UK companies. Our Conference Prospect database provides the contact details of 4,800 different corporate meeting, conference and event organisers within major UK companies. Our HR Prospect database contains the details of 2,500 HR and personnel decision makers within larger UK organisations. Our PA Prospect database contains the details of 2,000 PAs and secretaries within larger UK organisations. Our Event Agency Prospect database contains the details of 1,700 decision makers within approximately 1,000 different event management agencies who manage events on behalf of their respective clients and are instrumental with the choice of venue and services. 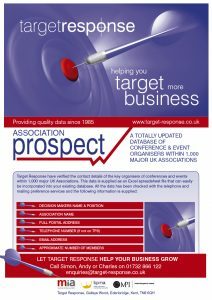 Our Association Prospect database contains the details of the key organisers of meetings, conferences and events within 1,000 associations. We now have a new managed email marketing service that will enable you to confidently approach approximately 11,000 event buyers without the risk of contravening GDPR. Target Response will dispatch your email allowing you to target event buyers with your own customised sales message. We can also supply any other bespoke data.